Before taking a Shaktipat Retreat with Swami Nirmalananda, I’d always felt that discipline was punishment. Now I understand that the discipline of Svaroopa® Vidya practices is a kindness to myself. It is deep support for my internal process. Having received Shaktipat from Swamiji yearly since 2013, I’m eagerly anticipating my fifth in October. My first was quite surprising. I’d been a yoga student for about three years when my teacher mentioned Shaktipat. She casually asked, “Do you want to come?” With each new Svaroopa® yoga experience over time, I knew it was what I needed. So, even though I didn’t know exactly what to expect with Shaktipat, I signed up. At the beginning, I knew nothing about the Guru or the Guru’s function. 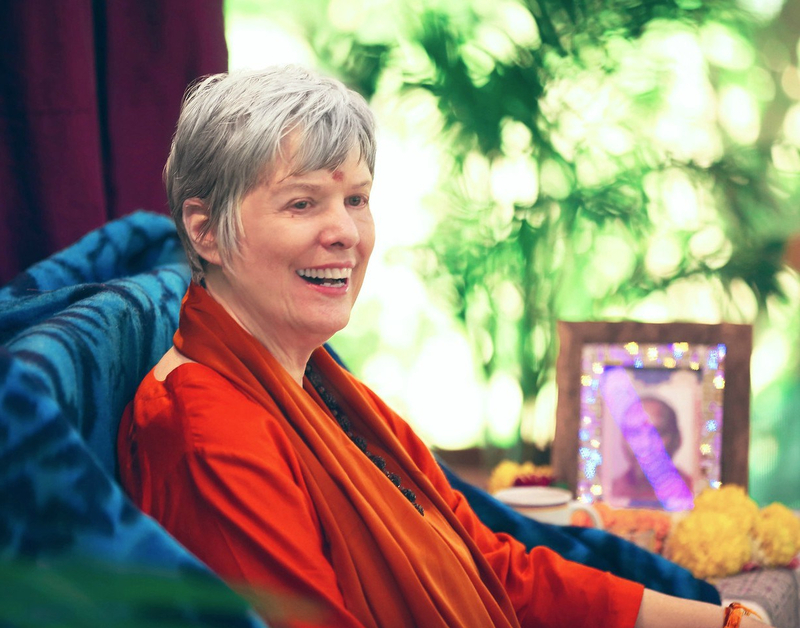 I knew nothing about her Guru, Baba Muktananda, nor his Guru, Bhagawan Nityananda. I now know this is our lineage of Shaktipat Gurus. It is the source of transformative power and Grace. Rooted in this lineage, Swamiji gave Shaktipat three different times in the retreat. With the first, I felt that she had reached through my whole spine and into my tailbone. Physically, my tailbone was painful. I wanted to be anywhere except sitting on my stack of blankets for meditation! At lunch Swamiji said, “It’s like childbirth. The pain has a purpose.” For me, the laser beam of Shaktipat into my tailbone initiated profound changes. When I returned home, I was different. Even though a beloved pet died a few weeks afterward, I navigated that process in a new way. I was more able to be present with the pain and sorrow instead of reacting against it or retreating. Again, I knew that this Svaroopa® Vidya path had given me exactly what I needed. After my second Shaktipat Retreat, I felt that everything inside was different. I had shifted. I thought, I don’t know what to do with myself. Then I thought, That’s right. To live from Self is different. The doors to my Self had blown open. And at my third Shaktipat Retreat, these doors opened to a vision of the whole galaxy. I realized this is what is inside. With each Shaktipat, the effect was more subtle and more profound. The uncovering of my deep Self continues to be a revelation. Every time, there’s more of that for me to experience, more of what I never knew was there. The More. I have come to know that these immersions bring me into the process of deep excavation. It unpacks the things I’ve carried with me for lifetimes. It can be painful. Yet I know that it’s only painful because my “small-s” self wants to avoid those things that are so deep. Ultimately, this process is joyful. So I keep doing my practices, and talking with myself about what I really want. I want to know the Self all the time. Now I know Self in my meditation, in my little home and talking to another yogi. But I want to know it at my job, at the grocery store and while taking out the garbage. My mind can’t quite wrap itself around what it means to be Enlightened. Yet through Shaktipat Retreats I’ve experienced beautiful glimmers of my Self. Being That all the time is an amazing goal. Shaktipat continues to create big openings, more space, more room within. I am then able to settle into my Self in a different way. My practices have evolved into a steadfast discipline in the last six months. Until then, practice first thing in the morning was not always a priority. My “to do” list would sometimes take precedence; I would get lost in the shuffle. But with steady practice now, I guarantee time in the morning for Ujjayi Pranayama, asana (poses) and meditation. When possible, I add chanting of Sri Guru Gita. If not, I chant it on the way to work, or sometimes at work. These practices support my state, integrating the experience of Self into daily life. My appreciation and gratitude for the ability to be in my life in this way — in relationship with a Guru who is there for me without fail — is immense. This entry was posted in Ashram News on September 4, 2018 by Svaroopa Vidya Ashram.